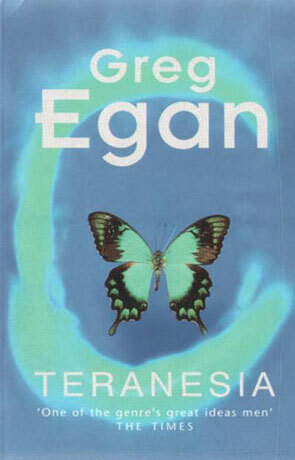 Teranesia is a science fiction novel by the Australian author Greg Egan. As per my usual routine I never read about a book before I start on it. I never read the back of a book before I start on it and I never, ever read other peoples reviews. If I had done any one of those things I wouldn't have been as surprised by this book as I was. Lucky me! This may not me the strangest thing that I've ever read, but it's definitely not what I expected from Egan. I was expecting the same as usual from Egan. I was expecting reality to be tweaked, I was expecting the laws of nature to be rewritten, I was expecting to be taken to the absolute edge of science. What I got was the story of Prabir. Prabir lives on a small island in the Indonesian ocean, with his little-sister and his parents. To entertain him self, he populate the island with imaginary creatures, both good and bad. A little lonely and a little strange, but all seems well, until one day the outsides world changes everything on Teranesia as Prabir calls the island. About fifteen year later Prabir has to follow his sister back to the Indonesian sea, to find the truth, to save his sister and maybe to die. There is some science in this, Prabirs parents where entomologists and his sister is a biologist. Something really strange is going on with the animals on the islands around the island where Prabir grew up, but mostly the story is about Prabir. In some ways it reminded me of Iain Banks The Wasp Factory. Not that Prabir is that fucked up, but this is a gripping story about a really messed up kid. He may be grow-up most of the story, but it's still a story about the kid. Written on 6th February 2002 by TC.